ANISTAR is a Middle-Eastern, Balkan Jazz Orchestra. 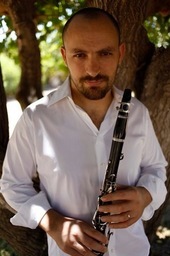 ANISTAR was formed in 2002 by composer, saxophonist and clarinetist Harel Shachal to explore the classical and traditional music of Middle Eastern and Balkan worlds from the perspective of New York downtown jazz. This ensemble seamlessly fuses elements of ancient and modern in its instrumentation and repertoire. The improvisations of Harel and the band seal this fusion by uniting the language of desert music with the aesthetic urgency of urban dwellers.